Faculty and staff are invited to "Leap on Down" to Long Marine Lab on February 29 between 11 a.m. and 3 p.m. for a special preview of the Seymour Marine Discovery Center. The public grand opening of the center will take place on March 11 and 12. 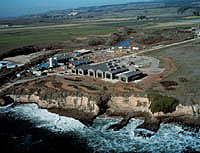 An aerial shot of Long Marine Laboratory shows the Seymour Marine Discovery Center in the foreground with the lab's research facilities and marine mammal pools to the left and rear. Also visible is ongoing construction for the Center for Ocean Health, a new research facility at Long Marine Lab. The Seymour Center is a new public education center at Long Marine Lab, featuring galleries full of aquaria, exhibits, touch tanks, an 87-foot blue whale skeleton, a gift and book shop, and much more. Overlooking the Monterey Bay National Marine Sanctuary, this beautiful new facility offers visitors a unique view into the workings of a world-class marine research laboratory. Exhibits focus on the work of researchers in UCSC's Institute of Marine Sciences, which operates Long Marine Lab. Extra shuttle buses to Long Marine Lab will stop at all campus SC Metro stops every 20 minutes starting at 10:30 a.m.
Memberships to the Friends of Long Marine Lab will be available at a 10% discount only during this preview event (regular memberships start at $20 students/seniors and $35 individual). Members can visit the center free all year long and will also receive an invitation to the members' opening event on March 5.